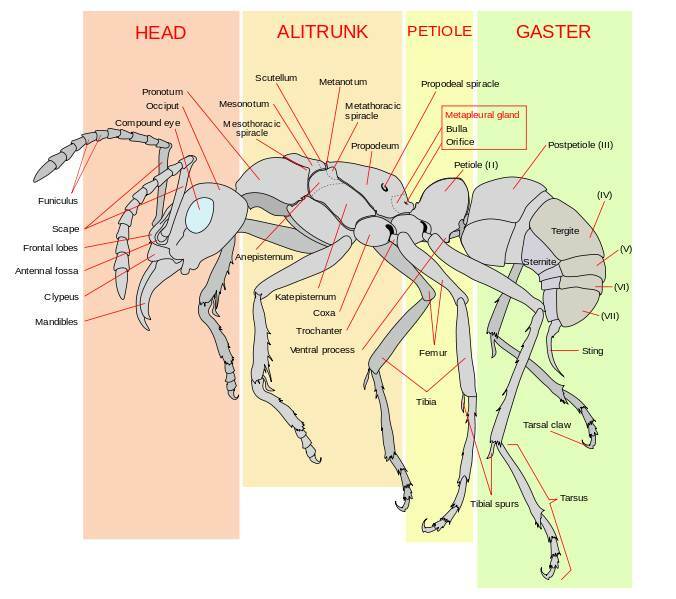 If you like to look at creature’s here is a description of how the Ants form and how they work together. They are one of the smallest and amazing creatures to look at. The ant is one of the social insects of the family formicidae. Formicidae is a scientific name. Ants evolved from wasp-like ancestors in the mid-cretaceous period between 110 and 130 million years ago and diversified after the rise of flowing plants. Ants form colonies that range in size from a few dozen predatory individuals living in small natural cavities to highly organised colonies that may occupy large territories and consist of millions of individuals. Larger colonies consist mostly of sterile wingless females forming castes of “workers”, “soldiers”, or other specialised groups. Ants have colonised almost every landmass on Earth. The only places lacking indigenous ants are Antarctica and a few remote or inhospitable islands. Below is a diagram of what the ant worker looks like and what features it has. Above is a quick and amazing video of how the army of ants work together to create a lifeboat in the amazon jungle.